Operating System has the same perspective for all the processes, irrespective of which language has been used to create the binary for the process. Its the same for JAVA , C , C++ , PHP, Perl , Python as its how the OS perceives the process . The representation is on RAM , so what we call stack , heap , data or code is a logical binding , as underlying storage is RAM. Stack is known to grow down with the criteria , one can add data onto the top and remove from the top. Stack elements can be removed starting from top , no random deletion of elements are possible. Both stack and Heap differs only in the logical way of accessing the data (insertion , retrieval and deletion) and both are mapped on same Map. What is so special about Java processes. Java classes runs on JVM which internally manages HEAP. The management guarantees that any allocation of memory on the JVM manged HEAP will be deallocated automatically. To deallocate JVM runs garbage collection threads along with the Code you write. 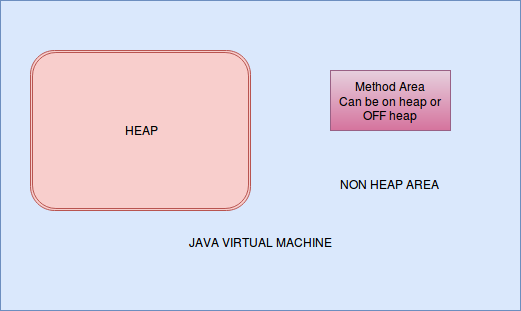 All Java does is manages a part of the HEAP , you are free to allocate memory(JAVA provides API) outside the Java managed HEAP. If one allocates memory outside JVM manged heap , deallocation is the responsibility of the programmer. Java code is compiled and executed , during code execution Java class files is consumed by JVM binary which generates instructions which are executed by CPU. Its not possible to instantiate Class on Stack in Java . This is representation of Java code From OS process memory model . Lets take a deep dive in How JVM manages the memory . Abstract view of JVM memory management.